Limited Edition 10" Vinyl, Handnumbered. 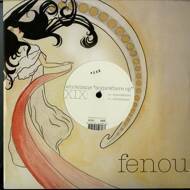 You’re going to feel relaxed and ready for summer after listening to fenou #19. On this 2-tracker the Swiss guy Benotmane skillfully combines groovy basslines, melodic synths and carefully adjusted vocal parts. „Somewhere“ is one of these tracks that carry you out in the morning sun. Later on when you listen again a melody snippet triggers memories of a perfect moment. The B-side is certainly no less exciting. Although the mood of „Submarine“ is more quiet, almost dreamier. Eyes closed, you’ll get wrapped in the sounds just to slowly drift away.